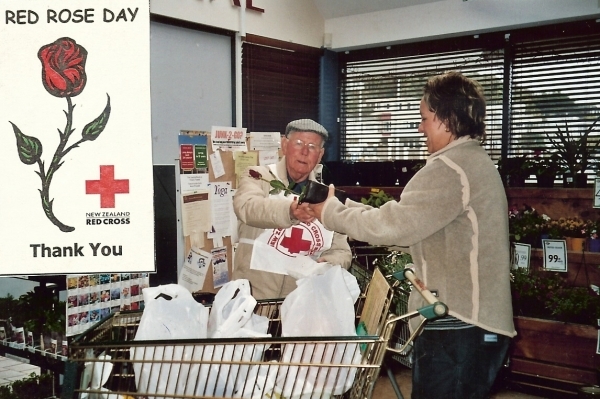 Photo of Plimmerton Red Cross member and supporter, Jim Gyton, always there to lend a helping hand, seen here at Mana New World on Red Cross Red Rose Day. On 27th September, 1939, after the declaration of World War II, a group of Plimmerton residents responded to the emergency and formed the Plimmerton Red Cross Branch. In 1940 the branch recruited several VAD (Voluntary Aid Detachment) personnel led by Miss Metty Vella, a foundation member. They travelled to Porirua for lectures and later worked in hospitals. The Transport Section required women to own a car or access to one, and were tested for a Heavy Trade Licence plus mechanical skills … all that was quite something in 1939! The war years saw committee members travelling to Wellington to pack prisoner-of-war parcels. To raise funds, bridge evenings were held and dances organised for the servicemen stationed locally. The cost was two shillings for men and one and sixpence for ladies and the profit went to purchase wool to knit garments for the men overseas. Raffles were organised – a sheep, a ham and a box of apples were some of the goods donated – starting a great fundraising tradition here. Placing an Anzac wreath at the Pauatahanui Servicemen’s Memorial is another branch tradition which has been observed since our establishment. 1941 saw the first picnic organised by our branch of the Red Cross for members of the Royal NZ Blind Foundation and this tradition continued until 2008. Red Cross focussed on the care of hospital patients after the war. The ‘Red Cross Shop on Wheels’ service at Wellington Hospital began and continued at Kenepuru Hospital. The ‘Beauty Care Team’ gave therapeutic facials to patients at Porirua Hospital, and ‘The Blue Ladies’ cared for patients’ needs in the wards of Kenepuru Hospital. 1971 saw the inauguration of the ‘Meals on Wheels Service’ which is an ongoing part of community life today. Volunteer drivers deliver meals to residents of Whitby, Paremata, Camborne, Mana, and Plimmerton five days a week. When the mobile NZ Blood Service visits Porirua, Plimmerton Red Cross members provide refreshments for the blood donors. Liaison kept with Porirua Emergency Management. 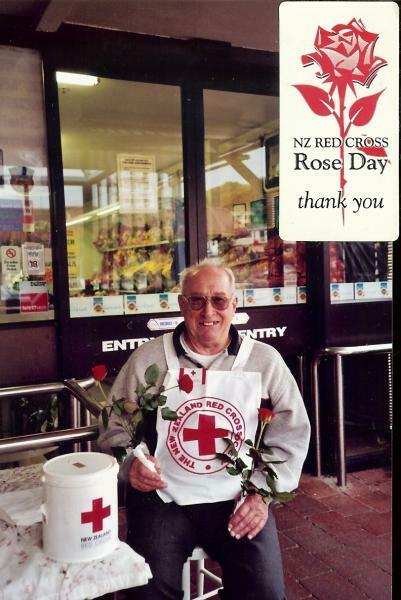 Plimmerton Red Cross member and supporter, Ron Ewen, selling red roses at Mana New World. Welfare has also played an important part, hand-made woollen rugs, garments and bedding are given regularly to the disadvantaged, elderly, children and to the Refugee and Migrant Service. Wheelchair, walker and crutches are availabe for loan. Summer is picnic lunch at Plimmerton Boating Club for Emmerson House Physically Disabled Residents of Porirua. The Plimmerton Red Cross also provides an incentive for oral healthy habits by providing a “Health Pack” consisting of toothbrush and paste to children who have had surgery for teeth extraction at Kenepuru Hospital. As with all humanitarian societies fund-raising is essential. We are most grateful to our local communities for their support when we are out and about on Red Cross Red Rose Day and with National and Disaster Appeals. The branch continues to put into practice the aims of the organisation, that is, to give help and well-being to the vulnerable wherever it is needed.